In 2012, Maria Christofilis (formerly of Anthousa) launched the feminine fragrance Fleur 09; it was limited to an edition of 80 bottles, and I somehow missed it both coming and going. Just this month, however, Christofilis has re-released the fragrance. Its formula remains unchanged: it is a white floral composition with notes of mandarin, bergamot, bitter orange, orange blossom, tuberose, vanilla and benzoin, originally developed privately for Christofilis by perfumer Rodrigo Flores-Roux. Fleur 09 is described as "a symphonic poem, exquisitely balanced and using only the finest and rarest oils—including best of the best elements from Givaudan’s Orpur® portfolio." The Orpur range is reportedly a top-of-the-line collection of raw materials (all of them may be natural, or not — you know how hard it can be to determine this sort of thing!). I normally take this sort of "finest and rarest" claim with a grain of salt, but Fleur09 actually smells like a high-quality perfume. 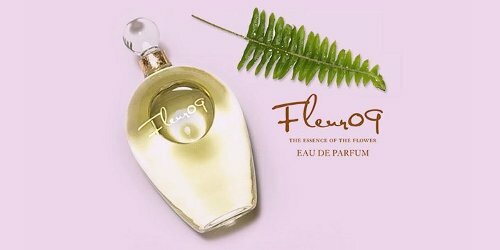 The original name for Fleur09 was "Fleur09-theessenceoftheflower," and to me, it really is a true tuberose soliflore. When I take a whiff of Fleur09 directly from the vial, it smells all buttery tuberose. On skin, it's more nuanced. It starts off as a slightly dirtied-up floral scent, with hints of indoles under its creamy white petals. It actually turns softer and more ladylike as it develops, but it still has presence. The tuberose heart is silky and elegant, yet not intimidating in the way that some white floral scents can be; I don't feel as though I need to look like a Hitchcock blonde or a 1950s VOGUE model to wear this fragrance. It's very feminine, with a touch of brightness from its citrus notes and a drop of sweetness from the vanilla in the base. On the one hand, Fleur09 is such a true-to-life evocation of a tuberose that if I closed my eyes and inhaled, I could believe the flower was right there in front of me. On the other, it seems to meld nicely with my skin. It has medium sillage and very good longevity. Note: I am not generally a tuberose-wearer. I like to smell tuberose as a cut flower in a vase, but Fracas and all its white-floral bombshell grand-babies (Frederic Malle Carnal Flower, By Kilian Beyond Love et al.) are just too much for me. I did enjoy Madonna's Truth or Dare — has it already been discontinued? — but I never purchased a bottle. Fleur09 seems like a tuberose fragrance that I could actually enjoy wearing on a regular basis. If you're a tuberose-lover, you should try to get a sniff of Fleur09; and if you aren't, you should still give this one a try. Fleur 09 is available now at Aedes and Maria Christofilis's website in 50 ml ($200) and 100 ml ($320) Eau de Parfum, as well as a 12 ml refillable travel spray ($68). You had me at “smells like a high-quality perfume.” I do love tuberose, so am interested in trying. I wonder if the bottle is a splash or atomizer…hard to tell. I hope you’ll get a chance to sniff this! I’ve seen the bottle in person, and they’re very pretty (hand-blown, btw! ), but I don’t remember whether they were atomizers or not. I’m sorry! I love the white florals. I got to sniff this last week at Aedes and it’s beautiful. It isn’t like a big bombshell white floral but isn’t so soft that it disappears either. I didn’t find it to have that heavy, stick to the nostrils feel of some tuberose perfumes. It smells like a quality fragrance. I second all of this! Some tuberoses make me feel a tiny bit queasy (the indoles? )… some are just too overwhelming. But this one “fits” me easily! Yep, don’t really do the tuberose. Perhaps the indoles, idk, same goes with gardenia. There is a ‘tuberose’ by Hdp I didn’t find bad…mostly cause I got iris instead of tuberose, LOL. Mmm, iris! Not a total loss then. Hmmm… perhaps a gateway tuberose? I have issues with tuberose as much as I want to like them, I often go scrubbing. Fracas, Carnal Flower, Truth or Dare are all no goes. I like to smell tuberose fragrances on other women… and they’re not quite scrubbers on me, but they often don’t fit my personality (I’m so much more of a rose-violet-carnation person), or else they just tickle my nose in an odd way! Yep, also a violet, rose, carnation person. Cannot do Fracas at all, sticks to the nose, thick and is not something I can sniff for long. Can’t even do Tuberose Gardenia by EL..which I found to be more wearable but still, too much. Well, sometimes on the rose…even rose can be too much, depending on the scent. That is true! — or depending on what the rose is paired with. I *am* a white-floral person… love Carnal Flower, not so much Fracas… but this sounds really spendy. I’d probably love it the way I love most other white florals, but I doubt I’ve got that much as-yet-unallocated perfume cash. It’s not cheap, certainly! — but what is, these days, right? At least it actually *smells* high-quality, and it’s niche and limited edition too, I believe.